FilerFrog is a new and innovative way of manipulating files in windows explorer. FilerFrog integrates with windows explorer as a shell extension so it can provide you with tools to perform your every day file manipulation actions easily and efficiently. Some of Windows explorer actions are cumbersome, for both the advanced and novice users. 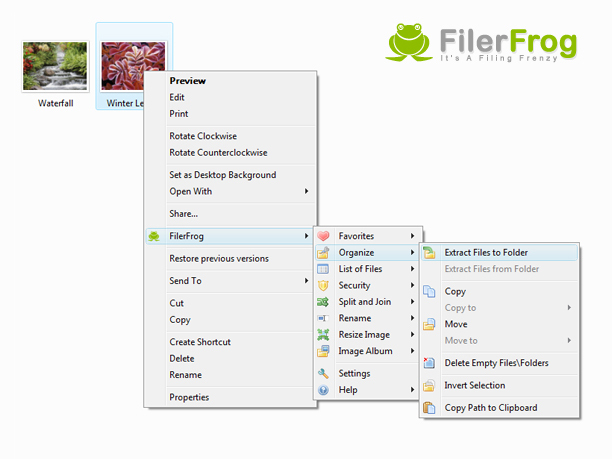 FilerFrog helps both types of users to perform file manipulation functions easier and more efficiently. ...... FilerFrog helps makes your business more productive by allowing your workers do their every day file handling operations easier. Rename - A common need for the home or office user is renaming multiple files or folders, perhaps to make simple changes such as making commonly understanable names or to create a sequence of entirely new names. FilerFrog's Rename make this easy: just select the files and/or folders you want to work with, right-click, and choose the Rename submenu. Image Album - FilerFrog presents the easiest way to share your pictures with your friends and family! Qweas is providing links to FilerFrog 2.2.0 as a courtesy, and makes no representations regarding FilerFrog or any other applications or any information related thereto. Any questions, complaints or claims regarding this application FilerFrog 2.2.0 must be directed to the appropriate software vendor. You may click the publisher link of FilerFrog on the top of this page to get more details about the vendor.